Need to boost productivity in your workday? Mobile apps are a must. But with literally thousands of them available to download onto your smartphone, it would be much too time-consuming to research and review each one for your business. While this is by no means an exhaustive list in the ever-expanding universe of business and productivity apps, we’ve highlighted the best ones for mobile employees to consider. All are available in the Apple Store or on Google Play. When your work is mainly mobile, the old-school to-do list on the dry erase board in your cubicle isn’t going to cut it. Nor will a Word document on your desktop computer. Any.Do is widely considered one of the most reliable to-do list platforms for both iPhone and Android users. Its fans credit its simplicity, as well as its compatibility across all of your devices. While its central feature is the almighty to-do list, it offers plenty of other helpful services. For instance, it has a feature that will remind you to return missed calls. A message will pop up alerting you to a missed call, offering you the option of calling the number immediately or setting up a reminder to return the call at a later time. Similarly, if you haven’t created a to-do list for the day, the app will pop up reminding you to organize your life by creating one. Perhaps the most satisfying feature of the app: All it takes to get rid of your completed to-dos is a hearty shake of your phone. Zoom is a great option for video conferencing or group messaging with co-workers and clients. While video conferencing technology has existed for years, Zoom takes it to another level. Available on all major operating systems, it allows up to 25 people (or groups of people) to set up separate video streams and up to 200 people to join the meeting as observers. Like many other conferencing apps, Zoom also lets participants share their screens with others to display presentations or other relevant work material. Xero is the ultimate mobile accounting platform. It creates a one-stop shop for all of your accounts and credit cards, allowing you to quickly create and send invoices. Most importantly, it lets you invite your financial advisor to work with you on your company’s finances in real-time. The app allows an unlimited number of users, so it can scale alongside your business as it grows. Xero’s basic model starts at $27.50 a month, while its top-of-the-line premium product is available at $70 a month. Aimed squarely at small businesses worldwide (it now claims 862,000 subscribers globally), Xero also provides its users with 24/7 hour customer service. It’s become ubiquitous at coffee shops and food trucks, but Square is an easy, affordable way for any small business to receive payments. There is a 2.75% transaction fee, so you may want to continue encouraging payment by cash or check, but signing up for Square (and receiving the accompanying card reader) helps ensure that you can always provide clients or customers an easy way to pay, no matter where you are. Square is particularly useful if you run a business in the service sector and you want to encourage customers to tip your workers. You can enable a tipping function that automatically asks customers to tip 15%, 20% or 25% or leave “No Tip.” It is rare that they choose the no tip option. How often do you see something online that you really want to check out, but you just can’t at the moment? Bookmarking the link or simply making a mental note to check it out later are both tactics that will often fail. Pocket is an easy way to flag items that interest you – a compelling article, a YouTube video or a silly listicle – so that you can access them at a later time. It also helps you avoid getting distracted by such things when you should be working; This way you simply stash it away for later. If you’ve ever caught yourself checking Facebook when you’re supposed to be focusing on work, you may consider going Cold Turkey. The app is a more dramatic tool to combat procrastination when you’ve got that looming deadline or just need to concentrate on a task. It allows you to impose restricitions on yourself by scheduling times throughout the day when you do not want to be able to access certain sites or receive notifications from ones that are liable to distract you. It’s extremely hard to undo the settings until the pre-set time is up, ensuring that you have nothing to do but focus on the task at hand! Like Cold Turkey, RescueTime is also focused on reducing procrastination, but instead, through education and awareness, rather than deprivation. The app tracks your online behavior and gives you a detailed analysis of the time you’re spending on different applications and websites. You can also enter in productivity goals and it will hold you accountable when you stray for too long from your stated task. Timesheet Mobile makes life and work easier for both managers and employees. The app empowers mobile workers to punch in and out of work remotely, which not only alerts the employer to the worker’s arrival or departure, but instantly feeds that data into the employer’s payroll system. This saves the employer time preparing payroll, helps monitor additional overtime hours, and allows them to quickly conduct in-depth analyses of their workforce so that they can more easily identify and address troubling trends, such as persistent tardiness or absenteeism. 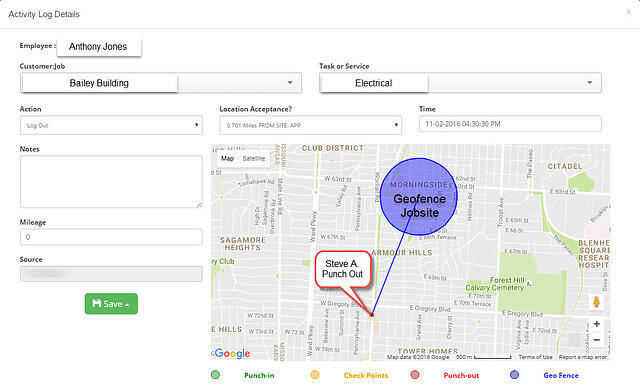 Timesheet Mobile also includes a key feature that has eluded many other time tracking applications: geofencing. Employers can easily set up geofences around designated areas, allowing them keep better track of their workforce. Punch Prompt® alerts remind employees to clock in and out and reminders can be configured to ensure effective communication while on-the-clock. A lot of business owners swear by Slack, the ultimate team messaging app. It’s a perfect tool for ongoing conversation between mobile workers at a company. Slack is also an extremely easy way to share files. The greatest distinguishing feature between Slack and similar messaging programs are its “channels.” Any user can create one – based on anything. A project-based channel allows you and others on the team to have an ongoing dialogue about the project and makes it easy to track project progress. Or you might establish a channel about a more general subject, such as ideas for new projects or the upcoming company happy hour! Channels can be public to the entire team or only accessible to those who you invite to participate. Slack has a free version that is sufficient for many teams, but for a monthly per user fee, you can get slightly enhanced versions that will allow you to integrate an unlimited number of other apps, create custom profiles and get additional storage space. Proven can make hiring a lot easier. First, it lets you post job opening to multiple job sites simultaneously. Second, it helps you quickly sort through the job applicants who respond by allowing you to separate them into “yes,” “no” and “maybe” categories. There’s an added function you can use to flag the applications you’ve already responded to, making it less likely that you’ll let a good application slip through the cracks. As jobs becoming increasingly more mobile, it’s important to identify the right set of applications that will help you and your team get the most done each day. The best apps should ultimately help you better engage with customers, keep your employees connected and enable you to meet your business goals.